Camping continues to gain popularity all over the world. To enjoy it fully, you should have a good night’s sleep, that is obvious. Since you want to enjoy your sleep and you don’t want to carry a lot of heavy gear, an air mattress will serve you just nicely. There are so many air mattresses for camping out there such that you might not know how to choose the best one because, at first sight, you might not be able to tell them apart. Because you are not an expert, reading air mattress reviews will help you make the best choice. With the best camping air mattress, you will be able to sleep as comfortably when you’re outdoors as you would back home. After reading through this guide, you will know what to look for in a camping air mattress, which will allow you to make the right choice. The good news is that you don’t have to look far because the ones I have reviewed here are the best air mattresses for camping and they are all available on Amazon. When deciding what sleeping gear you should buy for your camping experience, an air mattress wins because it occupies a lot less space when it is deflated, making it easier to store. Apart from the fact that an inflated mattress is ideal for your bad back, it won’t let you feel the ground beneath you, Furthermore, it is very comfortable and allows you to sleep cozily. To help you get the full value for your money, we have selected and reviewed for you the best air mattresses for camping, which are self-inflated and are available for sale on Amazon. Because it’s very comfortable, the SoundAsleep Dream Series Air Mattress allows you to sleep cozy, and you won’t actually realize that you are far away from home. The mattress not only inflates or deflates in 4 minutes, it also comes with an air pump inside it, which means that there is no need to remember to bring one with you. It’s very simple to operate. All you need to do to inflate is to simply turn the dial in one direction. When you want to deflate, just turn it back the other way. Compared to the other similar air pumps you will find on other air mattresses, this one doesn’t produce a lot of noise. If you are going camping in a hot area or during summer, this air mattress is your perfect choice because it has an extra-thick waterproof flocked top, which reduces the sweatiness you often feel when you are sleeping on an ordinary plastic camping mattress. Again, the extra-thick waterproof flocked top helps a great deal with insulation when you are camping in cold weather. I would advise that you bring with you a foam pad to place on top if you are planning to use the air mattress for cold weather camping. The mattress features a “Sure-Grip” bottom that prevents it from unwanted sliding. Camping will still be fun even for those people with limited mobility because this air mattress is double high – 19 inches (48 cm) tall – and even when you’re sitting on it, you will never feel the ground. It can hold weights of up to 500 lbs (227 kg). Due to the 40-coil, dual-chamber design, and the mattress is very strong, durable and firm. It is one of the best air mattresses for camping for a bad back because your weight is distributed evenly across the sleeping surface. The mattress is made from the 15-gauge PVC, a plastic material that is puncture-resistant and naturally stretches a little on first use, but this stabilizes after one or two uses. Measures 78 x 58 x 19 inches (195 x 145 x 47.5 cm) when fully inflated. Sold with a bag for storage and traveling. Fast to inflate and deflate with the patented push-a-button technology. It is easy to set up. Just plug the pump into the socket and in four minutes it is fully inflated. 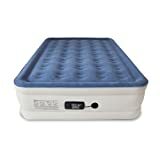 The Serta Raised Air Mattress with Never Flat Pump, which is truly a queen-size mattress and measures 80 x 60 x 18 inches (203 x 152 x 46 cm), is the perfect choice for you when you are going camping. The mattress has a durable flocked top that not only reduces the sweatiness you often feel when sleeping on an ordinary plastic camping mattress but also provides a soft and comfortable sleep surface that also prevents your sheets from sliding around. The bottom side is made from quality material and is non-slip to make it durable and stay put. Serta says that the mattress is made from high-quality materials that are puncture and water-resistant to make it durable. Even though it has only 35 circular coils, the presence of coils means that the mattress has good back support because they create a supportive and level sleep surface. Compared to the SoundAsleep, this mattress is an inch shorter (18 inches / 45 cm high), but this height is still that of an average chair, which is just okay. The fact that there are two pumps – the primary pump and NeverFLAT pump – in one bed is really very impressive. Of course, it is an airbed, and as expected, it will probably leak some air during the night. So, the built-in neverFLAT secondary pump monitors and silently maintains the bed’s air pressure to your desired comfort level to ensure that you sleep cozy. The built-in primary pump allows you to select with a dial whether you want a soft or firm feel, automatically inflates and deflates the mattress in about 4 minutes. The primary pump features convenient auto shutoff that turns its system off automatically when the mattress is fully inflated or deflated. The advantage of this camping air mattress is that it’s easy to set up, use and move around. It also holds air very well making it sturdy and comfortable to allow you sleep cozy as if you’re not actually on an airbed. So, if you have bad back problems, and often wake up in the morning in pain, this air mattress is your perfect choice. Serta Raised air mattress is made from a very thick, durable plastic with storage seam welds and this is the main reason it has the fewest leaking complaints. Perfect design of the pump and its ability to hold air is extremely impressive. Two pumps. One – for inflating and deflating, another – to monitor the air level while you sleep. Convenient auto shutoff system, which automatically turns the pump system off when the airbed is fully inflated or deflated. The pillow top for extra comfort. A cup on the side used for power cord storage. Made of extremely durable PVC material. Are you on a budget, and you are looking for the best camping air mattress that will allow you to enjoy your sleep when you are outdoors the same way you would do when sleeping in your bedroom back home? If you said yes, then the Intex Raised Downy Airbed is more than what you’re searching for. It can support a lot of weight. If you are going camping with your significant other, and you think you’re heavier for other queen air mattresses, you have nothing to worry about because this mattress will fit the two of you comfortably. As for the weight rating, this product is the highest among the five queen-size airbeds reviewed here. Simply put, Intex Raised Downy Airbed is one of the most convenient airbeds for heavy people. 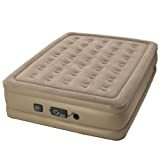 The main reasons this product made it among our top pick of camping air mattress reviews are its three features. First, you can fill it with a foot pump, and if there is no electricity available, it can be filled with other means. This means that you don’t have to bring your generator to use your air mattress, and you can still enjoy your camping in remote areas without electricity. This feature makes the bed a true camping air mattress. Secondly, this mattress is raised 22 inches (55 cm) from the ground, and that is a great height especially for people who have difficulties with mobility. Precisely, the height makes it extremely easy to use the edges of this bed. You can sit on the edge when wearing shoes. The third feature that really impressed me is that the Intex Raised Downy Airbed supports up to 600 lbs (272.16kg). The Intex Raised Downy Airbed has a flocked top, which is waterproof and reduces the sweatiness you often feel when you are sleeping on an ordinary plastic camping mattress. The Raised Downy Airbed is made from PVC material that is thicker than any other camping air mattress. Intex, one of the most trusted companies when it comes to the production of airbeds, says that the top plastic is about 0.0185 inches/20.8 gauge in thickness while the vinyl beams are 15-gauge. Provides extra comfort, stability, and support. Raised 22 inches (55 cm) from floor to make it easier to get in and out of. Engineered with the Dura-Beam technology. Features waterproof, extra-thick flocked top with vinyl beams and robust construction. Intended sides keep your queen-size sheets in place. When deflated, the bed has a dimension of 7.5 x 14.5 x 18 inches (19 x 37 x 46 cm) and 60 x 22 x 80 inches (152 x 56 x 203 cm) when inflated. A high-powered built-in electric pump will inflate and deflate mattress in about 5 minutes with a switch of a button. The bed is made from PVC, ABS, CU, and polyester. The mattress adjusts to your preference firmness for a comfortable night’s sleep. Sleeping surface of the mattress is covered in soft flocking for added comfort. Dual chamber construction – the lower and upper chamber. Deflates completely for easy travel and storage. Are you getting ready for some holiday guests and you are on a budget or you would like to go camping in style? Well, you can easily do so with the Insta-Bed Raised Air Mattress with NeverFLAT AC Pump. 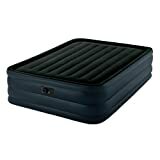 This airbed provides unsurpassed convenience and comfort at a great price. Whether you are staying in a vacation home, hosting guests in your home over the holidays, or you have kids coming for a sleepover, this airbed will be very convenient for you and it will allow your guests to sleep as cozy as they would do in their own bed at home. When you first set your eyes on this air bed, you might think that it’s construction is a bit clumsy. However, that’s not the case and the number of positive reviews and a high rating on retail websites reflects its effectiveness. Advanced technology makes the Insta-Bed Raised Air Mattress very comfortable. For instance, the sensors monitor air pressure continuously throughout the night. They also engage a silent secondary pump continuously to ensure that the mattress remains firm. The raised height makes this bed easy to get in and out of for both seniors and children. This air mattress comes with two pumps. There is the main air pump for inflation and deflation of the mattress. Secondly, a NeverFlat secondary pump kicks on to maintain the air pressure throughout the night depending on how you want your mattress to feel. The advanced technology allows you to choose your personal comfort level from the available three options – Plush, Medium, or Firm – and then let the main air pump inflate your bed. Once the powerful primary pump has inflated the mattress, the secondary pump will monitor and sense continuously throughout the night when it should silently engage so that it maintains your preferred comfort level. To inflate the bed, simply turn the primary dial to the right, and to deflate, turn the main pump dial to the left. 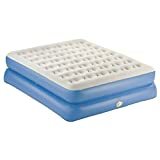 The main air pump allows effortless inflation and deflation of this air mattress. The pump shuts off by itself once the bed is inflated – thanks to the automatic shut-off feature. This technology really impressed me because it allows you to turn on the air pump and sleep or go your way without having to worry that the pump might burn out. At the side of the mattress just near the pump, you will find a small cup that you can use to store the power cord. The bottom of Insta-Bed Raised Air Mattress has a grippy texture to prevent it from sliding over smooth floors or carpet. Clear dial settings for plush, medium, and firm to allow for the choice of desired comfort level. 35 circular coil construction creates a super comfortable sleeping surface for a luxurious night’s sleep. Flocked top prevents the sheets from slipping. When fully inflated, this air mattress measures 80 x 60 x 18 inches (203 x 152 x 46 cm), so it’s truly a Queen-size airbed. Weighs 20.55 lbs (9.3 kg). Available in light brown color. Has weight capacity of 450 lbs (204 kg). For people who love to sleep in style when they go camping, the AeroBed Classic Double-High Mattress with Pump is a choice mattress for camping. It offers a great combination of features for not only comfort and convenience but also for durability and style, making it ideal for camping. In addition, when you are done camping, you can still use it at home for guests sleeping over. The height is perfect for easy access and exit from the bed, and therefore, it’s ideal for both children and seniors. With its high-rise construction, the bed not only looks like a regular box spring mattress, but it is also as comfortable as a normal queen mattress. When fully inflated, this air mattress measures 78 x 60 x 18 inches (198 x 152 x 46 cm), so, the regular sheets fit very well. Even though the sheets fit perfectly on this bed, there are still the deep side indentations that prevent the beddings from slipping by holding them tightly in place. With the AeroBed Classic Double-High inflatable mattress, you can easily turn any place into a fantastic bedroom. It comes with a handled pump, which you will only need to insert inside, and it will start automatically to inflate your mattress. When the morning comes and you want to pack up, there is the patented Whoosh valve that helps you deflate the air mattress with a lot of ease. The bed comes with a carrying bag that offers simple storage and transportation. AeroBed Classic Double-High is made from heavy-gauge, puncture-resistant 15 gauge PVC vinyl for durability. The sleeping surface is not only cleanable but is extremely smooth as well because it’s covered in a flocked fleece material. The overall coil construction provides enough support throughout the mattress. Has weight capacity of up to 600 lbs (272 kg). Queen size measure 78 x 60 x 18 inches (198 x 152 x 46 cm) when fully inflated. Raised 18 inches (46 cm) from the floor making it easier to access and exit. Oval coil construction provides still support throughout the mattress and offers a super comfortable sleeping surface for a luxurious night’s sleep. Provides extra stability, support, and comfort. With many camping air mattresses available in the market, you might find it very difficult to choose the one that suits your budget, desired comfort level, your weight, health condition and camping needs. To choose the best air mattress, you should consider its durability, ease of use, size, warranty, and comfort. In fact, these are the criteria I always use when writing air mattress reviews. Another very important thing that you should never forget is portability. Anything that is too heavy is a no-no, let me say that the air mattress that you buy should be below 40 lbs (18.5 kg). Also, consider the reviews posted by other users online so that you do not buy blindly. If they say keep away from it, do not buy it. Always look for the highly rated items, although they may cost more money, you will get more features from them and they will last a long time. The best camping mattress should be the exact size that you are looking for. For instance, if you are looking for a queen-sized one, then the mattress should not be full-size. A true queen-size should measure 80 x 60 inches (203 by 152 cm). In that way, it will fit your sheets perfectly. A great camping mattress should be easy to set up and use. Before placing an order, you should be sure that the mattress is easy and quick to inflate and deflate. This is important especially if you’re buying a mattress that is inflatable manually. Mattresses with built-in air pumps are the best in this regard because they are self-inflating. Of course, you want to sleep cozy and enjoy your night’s sleep when you’re outdoors. Therefore, a great air mattress must have soft sleeping surface and must remain firm throughout the night. I prefer camping mattresses with flocked tops for one main reason. First, they don’t make you feel as cold when you’re camping in cold weather or as sweaty in the summer the same way you would when sleeping on ordinary plastic mattresses. In other words, the best air mattress for camping has flocked tops. The taller the air mattress, the greater it is. It’s easier to access and exit taller camping mattresses. Generally, minors, seniors and anyone else will find it easier to get on and up from a taller mattress. If you have limited mobility, you will feel more comfortable sleeping on a double-high air mattress than a foam mattress on the ground. A great air mattress should not leak. Before you make a purchase, read camping air mattress reviews, and choose the one with the least or no complaints about leaking. When selecting the beds that we have reviewed here, I picked air mattresses with no leakage issues. You don’t want to wake up in the middle of the night only to find yourself laying on the floor. Well, that’s exactly what happens when you buy an air mattress that leaks. The secret is that almost all air mattresses leak. This is one of the reasons some manufacturers developed double pumps with one of them monitoring the air level and silently adding some air to it during the night. Whether you are on a tight budget or not, or you just have unlimited funds, you deserve to have a great air mattress for camping so that you can enjoy your holiday to the fullest. To get the best value for your money, you should buy from manufacturers that offer reasonable warranties for their product. Otherwise, you might end up spending your money to repair the air mattress for a fault that was not yours. Warranty is very important because if the product develops a fault after purchasing, you will be on the safe side because the company will replace it free of charge. Many people buy products on the market and may not know how to use them for the first time. That is why you need to consider customer support so that you can ask questions about how to inflate or deflate your air mattress, how to repair and so on. In addition, you may not find the product warranty information on Amazon and therefore you would have to ask the manufacturer or the supplier. Now you know the criteria that you can always use when looking for the best air mattress and the available ones in the market. You can now make a decision easily on what air mattress is best for you. In this review, SoundAsleep Dream Series Air Mattress I consider the best because it’s the simplest to operate, it inflates within the shortest time and has high ratings online, which is the best among all the five air mattresses we have reviewed. Let me know if you have experience with other air mattresses bu writing a comment below.